The Ultimate football game in a box! 1st & Goal pits two football teams in a classic gridiron match. Players call the plays using the cards available in their hands. Yardage gained or lost is determined by the roll of the dice. So strategic play calling makes all the difference as to which dice you get to roll for each play. Choosing the right offensive play might get you a lot of yardage... unless the defense sets up correctly to stop it. Fumbles, interceptions, sacks, penalties, deep passes, breakaway runs... it’s all in here! Well, my little sportsters. Today, I have to do something I really do not like to do. I have to give a bad review. Game designers spend a lot of time working on games, and I can tell the people who made 1st and Goal really loved what they were doing. But, 1st and Goal is a little broken. The game is purely a luck-driven affair. It is far too convoluted and long. I’ll provide a breakdown of the game play first, and then explain my criticisms. I think there is a good party game in here… but it’s going to take some house rules. The game is pretty simple once you figure it out. I thought the rules made it seem more difficult than it really is. You have several colored dice with yardage on them. A Play die is used with all the plays and has events like Turnover, Penalty or Breakaway. You also have a Ref die to decide who the penalty is on, and a Penalty die to decide the yardage for the penalty. 1) You decide who is home or away. 2) You flip to see who is receiving. 3) Kickoff rules are easy. You either start on the 20, or roll red,beige,brown,blue and Play die and add it up to show where you start. Follow the rules for the Play die if any. 5) Now, you are ready to actually play. Each player has either an Offense or Defense deck. You get 8 cards to look at. You pick the card you want to go with… and show the card simultaneously. You compare cards to see what dice are to be rolled and follow the dice based on yardage and the Play dice event. Discard and draw. 6) You get 4 downs to get 10 yards or you need to punt, fake or decide to go for it… which may result in turnover on downs. The game really does mimic a football game. For those who love football, like myself, there is a lot to “want” to like here. Unfortunately, unlike football, there is absolutely no skill involved in playing this game. You are basically trying to guess if the other player or team (you can make two teams if you have more that 2 players) is going to run or pass. Then, you roll a bunch of dice and do some simple math. The components are a mixed bag. I love the field, football and yardage marker. The ball and marker are magnetic… stick to the field. However, the dice are cheap plastic boxes that require a good half hour to stick on all the stickers. We’ll see how long these stay on. I would have liked etched dice… or even painted dice would be better. The game is also very long. You are supposed to go through the entire Offense deck for each half. We decided it would be more bearable if you split the deck and played half a deck for each half. If I’m going to play a board game that takes longer than an actual real life football game… it better be Arkham Horror. Nevertheless, there is a fun party game in here somewhere. I think it needs to be shortened and house ruled. It might also be fun to make some wagers. It needs work, and maybe I’ll find some time to fix it. Until then, I can’t recommend it. Granny likes real football best. The game itself is not so bad just very long and has little to no skill involved. The game is a try to guess the other players move type of game that consist of an offensive play deck and a defensive play deck. Each player selects a play and flips it at the same time. The cards then have a reaction to the cards played either for the good or bad. However, there is a penalty, turnover, and incompletion on the di so there is a possibility that even though you bluffed great and caught the defense in a bad situation you can still very easily not benefit from the outcome. The game is very long as the rules state the 1st half ends when all offensive cards have been played, but this makes the game last a bit longer than a real football game. Its not super hard to learn and if I had nothing better to do on a Sunday afternoon I would play it again, but its not better than the real deal. 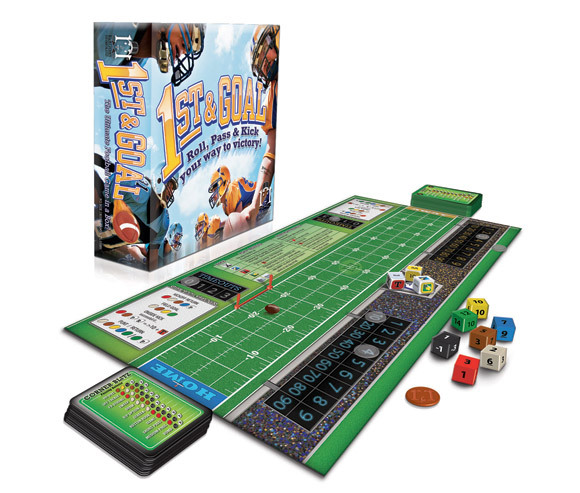 Add a Review for "1st & Goal"